Located at the entrance of the city, the site is subject to a fast track highway from the northern side, facing the Bahrain Financial Harbor; and to the urban fabric of the old Bahrain city from the southern side. The intervention should tie, connect but not flatten: the surface opens up from the highway to allow the vehicular circulation in and provide parking space; while it remains flat from the city side and slopes down gently creating a piazza and inviting the pedestrians in. The ground floor surface is the symbol of the return of the public dimension to old city of Bahrain, in a radical gesture of openness and informality. It is conceived like a barely covered public space: the lower ground level is an open platform that slopes gently down to the hub in the center. The platform can house informal events that are encouraged to spontaneously happen: food kiosks and mobile merchants, art exhibitions, music. The indoor areas consist of the post office, national archives, food courts and cultural and children’s museums as well as indoor exhibition spaces. Due to its strategic location, the hub carries a potential of becoming a transportation hub in the future. The gentle slope becomes stronger as we approach the highway to shelter from the busy flow and to allow the possibility of more controlled events in the form of stage. The Ferris wheel remains an iconic part of this public hub and becomes a landmark. 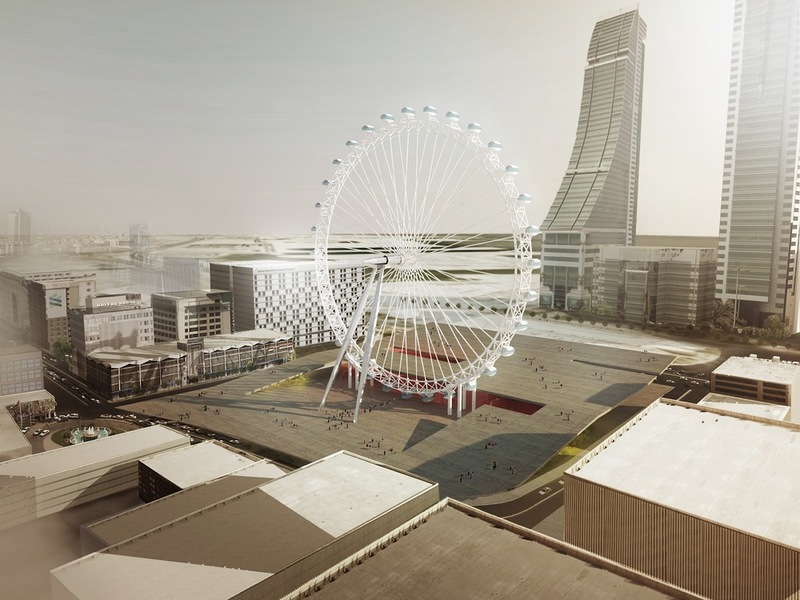 It extrudes the public square vertically in the skyline of Bahrain, thus projecting the old city as a view and reconnecting at least visually to the sea level. In this iconic landmark for Bahrain that is estranged to the surrounding, we challenge the vis-à-vis to the built-environment and create a playground where the public aspect is raised to regain access to the sea.